One day, Tyrell Jenkins will be dominating St. Louis and national headlines as the next big arm to emerge from the stacked Cardinals’ farm system. St. Louis took Jenkins in the supplemental first round of the 2010 MLB draft with the 50th overall pick. He is six foot four inches tall with a long, lanky frame that resembles more of a two-guard in basketball than a baseball pitcher. Either way, the Cardinals drafted him because of his very high ceiling as a pitcher. Many national scouts portray him as a front-end of the rotation guy in the future. By the time he cracks the big leagues (possibly the 2016 season), he will most likely be joining a rotation full of past farm system members such as Lance Lynn, Shelby Miller, Michael Wacha, and Tyler Lyons. 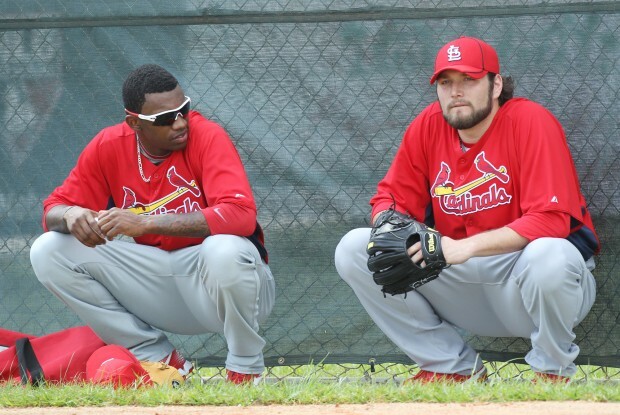 The Cardinals will have current rising prospects, Carlos Martinez and John Gast, as well. I hope that Jaime Garcia will be healthy by that time, but the Cardinals will most likely move on from him considering the amount of money he will command and the depth that they will have built up by then. Also, franchise cornerstone, Adam Wainwright, is under contract through the 2018 season, so it will be an extremely crowded rotation unless some roster moves are made by General Manager, John Mozeliak. In 2012, for the Quad Cities River Bandits, Jenkins finished the season with a 4-4 record after pitching 82.1 innings in 19 starts. The figure that stood out the most was his strikeouts per nine innings statistic–8.7. It may not look like one of the best statistical seasons for a future MLB pitcher, but one must not forget that he was only 19-20 years old at the time. This year, he is playing for the Peoria Chiefs (Single-A). So far, in ten games started, he has a 4-4 record with a 4.74 earned-run average. He has two complete games with one of them being a shutout. Thus, again, the statistics are not sparkling by any means, but it his stuff and the potential he has that the Cardinals’ coaches raved about during Spring Training the past two seasons. He was also named to Midwest League All-Star team for his performance thus far this season. 1. Fastball: He is very capable of being a flamethrower considering he is able to touch 96-97 MPH on the radar gun, but in order to be a successful starting pitcher, he will most likely average between 92-94 MPH once he reaches the big leagues. 2. Curveball: This pitch has the potential to be absolutely devastating for opposing hitters. Throughout his minor league career and in Spring Training, he has shown flashes of this being a fantastic pitch for him. It has tight spin and has a serious downward bite to it, but he is still developing a consistent release point for the pitch–something that will come with proper coaching and more experience. 3. Changeup: Jenkins disguises this pitch well by using the same arm motion and speed as his fastball. However, at this time, it has very little movement. This will most likely change as he develops and learns to trust his pitches a little more. Unfortunately, Jenkins was removed from his last start in the third inning with a shoulder issue. He has since been placed on the disabled list, but according to farm director, John Vuch, doctors do not believe there is anything structurally wrong with the shoulder. Jenkins is likely just suffering from shoulder fatigue–something to expect from such a young arm at this point in his career. Thus, he has been sent down to Jupiter to work through a throwing program before returning to live action. Jenkins is considered a “scout’s dream for a pitching prospect” who has the length and athleticism to pitch deep into ball games at the big league level. The 2016 season may seem like a long way off for me to be talking about him, but he is the type of pitcher that it is hard to not talk about whenever you get the chance. As long as he is able to stay relatively healthy and continues to develop his stuff, I can see him as one of the next guys that the national media won’t stop talking about–like Miller and Wacha right now. This entry was posted in St. Louis Cardinals, Tyrell Jenkins and tagged St. Louis Cardinals, Tyrell Jenkins by stlcupofjoe. Bookmark the permalink. You r doing a great job young man. Keep up the good work.